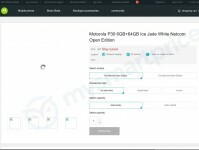 Motorola is hosting an event on August 15 in China and everyone is expecting the Moto Z3 and the Motorola One Power to land in the country but going by the company's official Chinese website, three other phones might be the stars of the show. We are looking at the Moto P30, P30 Play and P30 Note - phones, which we haven't heard of before and don't know anything about. The pages reveal only the memory configurations and the color options - the standard P30 comes with 6GB/64GB and 6GB/128GB in Ice Jade White, Bright Black and Aurora. The P30 Play - assuming that's the budget variant - offers only 4GB/64GB memory and comes in Ice Jade White and Bright Black. Judging by the name, the P30 Note should be the largest of the trio and its listing reveals that it's coming in 4GB/64GB and 6GB/64GB configurations with the only color available being Bright Black. That's pretty much all we could gather from the listings and we are curious to see where the P30-series will be positioned with the E lineup intended for the low-end segment, the Z-series for the premium market and the G-series sitting in between. Weekly poll: Motorola Moto Z3: hot or not? yeah some would starve and not go to school for iphones and supreme stuff. something is going wrong nowadays, including the blind fanboism.